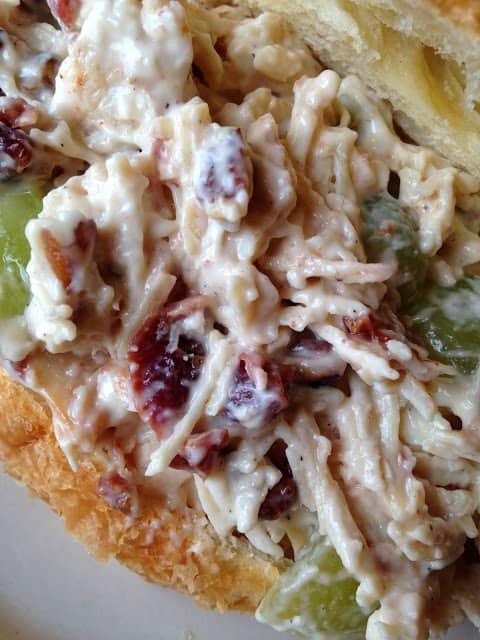 Cherry Grape Chicken Salad is hands-down my favorite chicken salad recipe. It’s so easy, yet so good. 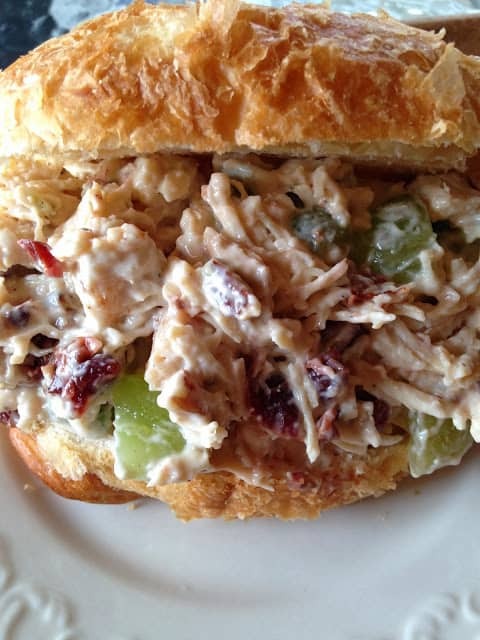 This chicken salad recipe has all of our favorites wrapped into a yummy sandwich filling. Ingredients such as: chopped dried cherries, diced celery, fresh green grapes sliced in half and toasted pecans. Doesn’t that sound like a delicious line-up of ingredients. The star of this recipe has to be the chicken. I like to make this salad using a rotisserie chicken. Rotisserie chicken can be purchased at any grocery store, supermarket or super shopping store such as Sam’s Club or . For this recipe, stick to the unflavored or plain/original flavored rotisserie chicken. I made the mistake once of not looking before I grabbed a rotisserie chicken out of the warming case. When I got home, I realized I bought a barbecue flavored chicken but decided to make this chicken salad anyway. Though it was still good, it wasn’t excellent, like it is when using the plain/original flavored chicken. Recipe tip: Rotisserie chickens are made “fresh” daily. Many times, stores will reduce the price of chickens later in the day or reduced priced chickens can be found in the refrigerated section near the deli department. They make excellent chicken salad!! Croissant [kwah-SAHN; KWAH-sawn; kruh-SAHNT] is the French word for “crescent.” Originally, the croissant was made from a rich bread dough. It wasn’t until the early 1900’s that a creative French baker had the inspiration to make croissants with a dough similar to puff pastry and a classic was born. Croissants can be made with buttered layers of yeast dough or puff pastry. They’re sometimes stuffed with chocolate or cheese before being rolled into a crescent shape and baked. In a large bowl, add all ingredients in order given. Serve on a Sliced Croissant. 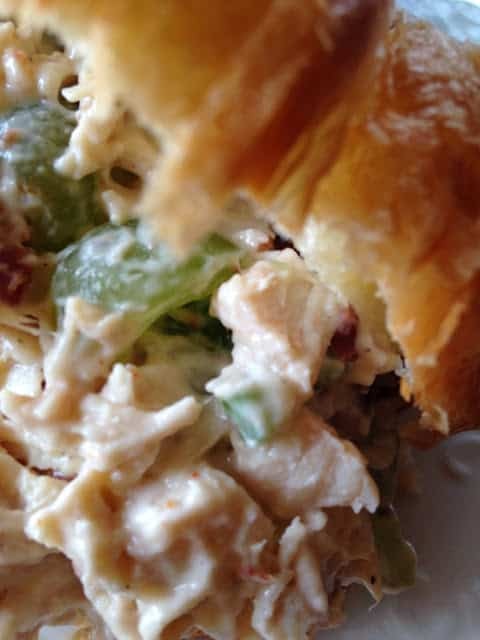 Serve Cherry Grape Chicken Salad on Croissants with bowls of White Cheddar Cheese Chili Popcorn for a super lunch. My guys don't care for fruit (like grapes) in chicken salad, but I love it. I especially like that you've added cherries! I'll just have to make this for myself and eat it all…which would be no problem haha! Thank you for sharing, Lynn. Your recipe is one of the Top Five features when tonight's party goes live. Lynn, this sounds wonderful and I love that you added cherries. 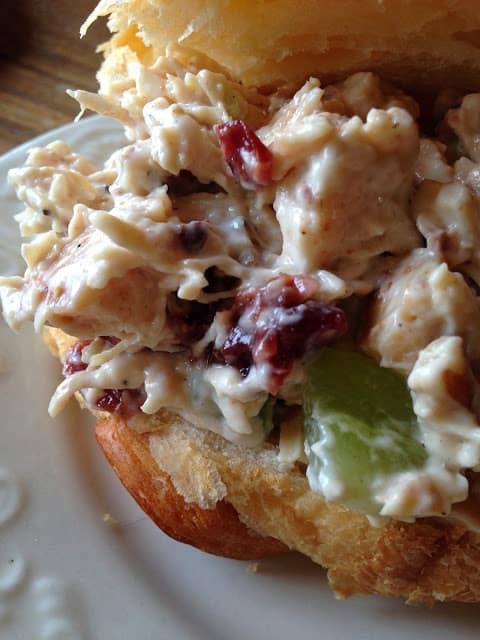 What a great sweet taste to the chicken salad!